GEORGE TOWN, Malaysia – The last mangrove swamp in Batu Maung here is now under threat of being turned into a dumpsite as tracts of the land were filled with industrial and construction waste. Sahabat Alam Malaysia (SAM) and Penang Consumers Association (CAP) said the mangrove forest was the only green lung left in Pekan Baru Batu Maung, just next to the Bayan Lepas Industrial Park. “There are only about 20ha of remaining mangrove forest here due to development in this area so it must be preserved and protected for our future generation,” said SAM and CAP research officer S. Mageswary during a site visit to the area with the media. About 15 per cent of the 20ha mangrove forest is now barren and buried under mounds of rubble, rubbish and construction waste. She said the land belonged to the federal government and was under the supervision of the Fisheries Department. 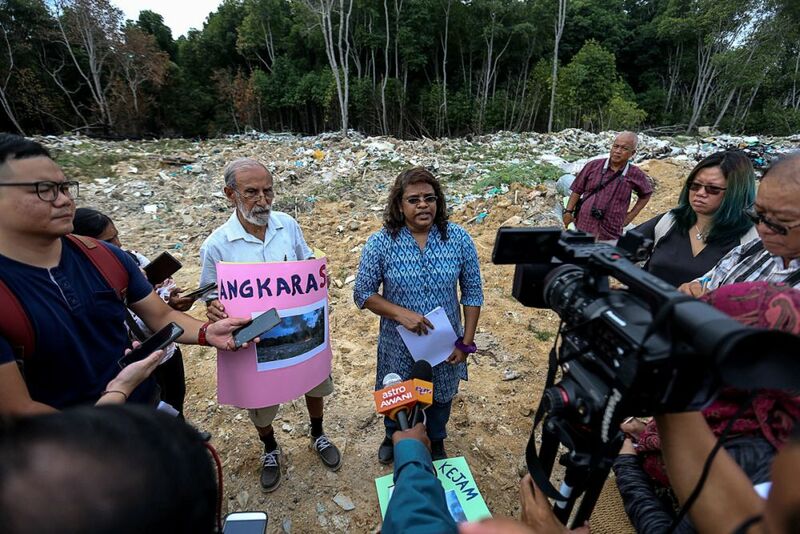 “We don’t know who is dumping waste here but it is surprising that lorries can bring in waste and openly dump it on government land,” she said. According to CAP complaints bureau head, Ravinder Singh, the illegal dumpsite caught fire on January 22. “I live around this area so I noticed black smoke coming from this area last week and upon investigation, found the dumpsite here had caught fire,” he said. The mangrove forest is located along the fringes of the Penang International Airport, the Fisheries Research Institute Malaysia and the industrial zone. “Due to its proximity to the airport, when the fire occurred on January 22, the airport authorities immediately called in the Fire and Rescue Department to put out the fire due to the risks it pose to the airport,” he said. The dumpsite at the mangrove forest is located about 0.5km from the airport. Ravinder expressed shock at the inaction by the authorities to stop people from illegally dumping waste at the site. “We demand that action be taken against those responsible for clearing the mangrove land and indiscriminately dumping rubbish there,” they said. They pointed out that the large amount of construction materials can be traced to the contractors responsible so the authorities must take immediate action. “This is the sole surviving patch of mangrove forest in this area, it must be accorded better protection,” Mageswary said. She said the brackish river that flowed through the forest is also now polluted by leachate. They said a mangrove forest is important to maintain water quality, trap sediments and filter pollutants in the area.